Not done partying, even though St. Patrick’s Day has passed? Worry not: It isn’t the only holiday taking place this week. 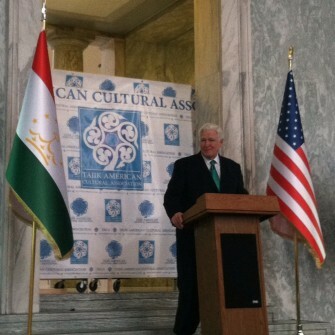 Rep. James P. Moran, D-Va., celebrated Persian new year with a group of Tajik-Americans in Rayburn House Office Building Friday night, but noted that the less well-known holiday might be overshadowed. “Unfortunately you’re coming here kind of at the same time as another tradition: The Irish-American celebration of St. Patrick’s Day,” he told the crowd. “There are a few more Irish-Americans than there are Tajik-Americans,” he quipped. “I’m still Irish, but frankly I try to avoid it: too much drinking and too much, uh, celebrating." While the debauchery geared up around the city and Moran excused himself to, he said, drink some Guinness and try to keep his Kelly green tie clean, organizers from the Tajik American Cultural Association hosted a showcase of their native culture. The setting was almost surreal: performers in colorful garb harkened to ancient Central Asian culture with dances in the maschohi and kulobi styles against a backdrop of neo-classical marble in the Rayburn foyer. Ustod Shavkatjon Badalov, a master of classical Tajik music, came on short notice from New York City to play the rubob, a traditional string instrument. “This presentation is just a drop in the vast sea of our culture,” Anvar Samadzoda, public relations manager of TACA, said between performances. Modern-day Tajikistan was once part of the Persian Empire under the Samanid dynasty and, centuries later it became part of the Soviet Union. It is populated mostly by Persian-speaking Tajiks, cousins of Iranians and Afghans who also celebrate Persian New Year . With borders with Afghanistan, Iran and Russia, and a possibly large reserve of natural gas, Tajikistan would seem at least latently important to American interests. But it’s not really, said Martha B. Olcott, senior associate with the Carnegie Endowment for International Peace’s Russia and Eurasia Program. The biggest topic in the U.S.-Tajik relationship, she said, is the Rogun Dam, which could help solve some of Afghanistan’s energy needs, but would also cut off much of Uzbekistan’s water supply. “It’s like the giant hot potato in Central Asia,” she said. But that’s about it, at least from her perspective. On strategic concerns, Moran told HOH during the reception that he considers Tajikistan to be very important because of its geographic location and recent economic growth. So it’s hard to guess what the payoff of Friday night’s reception might be for U.S.-Tajik relations, but who could say no to a little springtime fun in Rayburn? Persian New Year, or Nowruz, takes place on the vernal equinox — March 20 this year — and is celebrated with multiple holidays starting this week and ending early April. If you missed the March 14 cultural edification, you’ve got another chance for Tajik immersion: TACA is hosting a concert with singer Jonibek Murodov Saturday. www.youtube.com/watch?v=bt1Ys4GZcYQ Go ahead, gear up for your Central Asian serenade. Spring is in the air!